Vidal Blanc is a hybrid grape — a cross between Ugni Blanc and Rayon d’Or — created in the 1930s by Jean Louis Vidal. If you’re from the sunny state of California, as I am, and have never heard of this varietal, that’s not surprising and nor are you alone. Because of the grape’s thick skin, it thrives best in cold, even downright icy regions. In fact, it is considered one of the great grapes of Canada, where it’s often used to create ice wines — wines created by picking the grapes when they’re frozen and contain more concentrated sugar levels. Maryland does have cooler temperatures (sometimes dangerously frost-filled winters), which opens up the vineyard playing field to interesting grapes like Vidal Blanc. And, while this is no dessert wine, be warned my dry white wine lovers, that you’re in for an interesting twist ahead with the Big Cork Vineyards expression of this quirky grape. 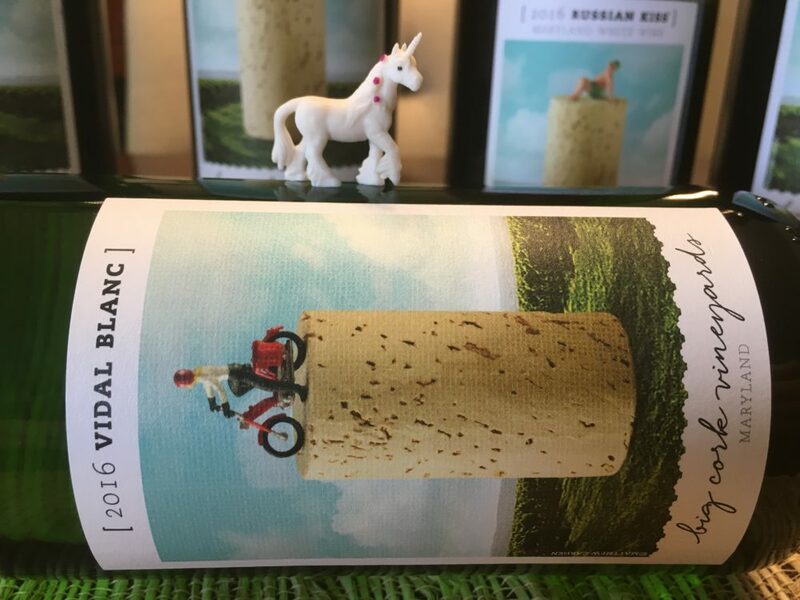 About the Wine: The Big Cork Vineyards 2015 Vidal Blanc is made from 100% Vidal Blanc grapes harvested from the Big Cork Vineyards estate vineyards located in Central Maryland. The wine was aged for 5 months in 100% stainless steel. Flavor Profile: Pop the BIG cork and you’ll immediately be immersed in a tropical island of aromatics. The Big Cork Vineyards 2015 Vidal Blanc is very nearly clear on the pour, settling into the glass as the most pale straw yellow. Primary aromas are of passionfruit, guava, peaches and nectarines. Swirl and find floral aromas reminiscent of white gardenias, fresh cut wet grass, and a background scent of a soft nut, like either cashew or macadamia. On the palate, the Big Cork Vineyards 2015 Vidal Blanc is a sweeter wine to be sure. “Semi-dry” by definition, some may find the initial sip a little cloying, but I encourage you to overcome that element of surprise and sip again. Dominant flavors are of stone fruits like peaches and apricots. There’s an undeniable floral element that, because of the consistently mellow acidity that rides throughout the tasting, provides a bit of a perfumey quality. This light-to-medium-bodied white wine has an interesting finish, for it’s here that the acidity seems to give just the tiniest little toe-kick on the tongue, causing pause for thought as to — what is this Vidal Blanc really all about? Food Pairing: The finish also leaves a bit of texture on the tongue as well. So, as “sweet” as it is, this is definitely a wine that will best be enjoyed with a savory meal. Specifically curry. Specifically spicy Indian curry. Specifically spicy Indian curry with either slow braised meat (goat, chicken) or slow braised hearty vegetables (eggplant). 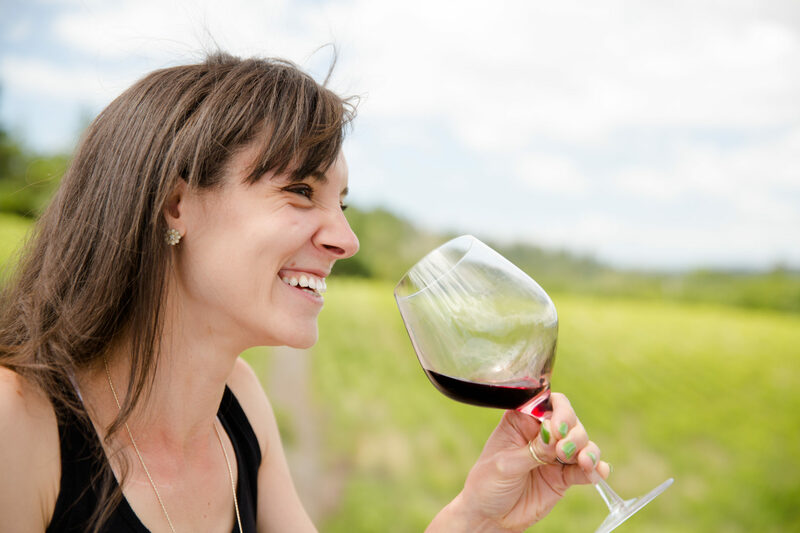 The element of sweetness in the wine is just calling for those herbaceous spices found in such a curry and those spices — to be certain — will call out that shy bit of acidity in the wine. Perfect marriage. More Info: I received the Big Cork Vineyards 2015 Vidal Blanc as a sample for review. (Cheers Amy!) Retail: $18. For more information about Big Cork Vineyards and to order wines directly, please visit the Big Cork Vineyards website.